In fantastic news for the fortunes of the Texas baseball team, catcher Cameron Rupp’s shoulder injury is not as serious as initially feared. Rupp took a pitch directly to his collarbone in Tuesday’s game against [tag]Texas State[/tag] and the rumors were he would be out an extended period with a broken collarbone. Instead he was back out at practice already today and suffered only a deep bruise to his shoulder/chest area. There is no word yet whether Rupp will be available for this weekend’s series against [tag]Stanford[/tag]. 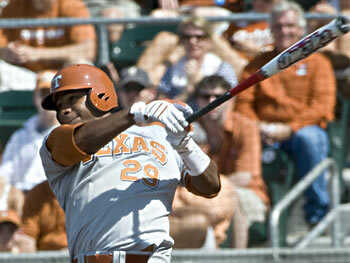 Longhorn baseball team defeats Kansas 8-6 in Big 12 Conference opener. Cameron Rupp hit two home runs. 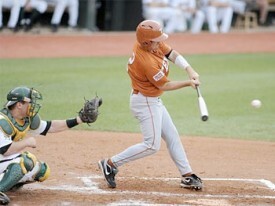 The Texas Longhorns had a rough weekend at the Houston College Classic at Minute Maid Park but finished it off Sunday with an 8-7 win over the hometown [tag]Houston[/tag] Cougars. The Horns went into the seventh inning with a 6-1 lead thanks mainly to a three-run [tag]Cameron Rupp[/tag] single in the first and a two-run homer in the fifth by first baseman [tag]Brandon Belt[/tag]. Texas starter [tag]Cole Green[/tag] pitched six strong innings before fading quickly in the seventh and giving up four runs before being pulled. The Cougars added two more runs in the top of the ninth to send the game into extra innings. In the bottom of the tenth, freshman [tag]Connor Rowe[/tag] played the role of hero by singling in the game-winning run in his first college at bat. Rowe knocked the 2-0 pitch into centerfield to easily score David Hernandez from third base and give the Longhorns the much needed win.